Black stove pipe is used only as a connector pipe between a wood stove and the chimney. It cannot be used as a chimney system (installed inside of walls or attic, for example) and it cannot be used inside of a masonry chimney. Black stove pipe is single wall construction, 24 guage, and painted black with a high temperature paint. Be sure and use 3 screws to connect each pipe joint. CLICK ANY ITEM LISTED BELOW for pricing and complete selection. 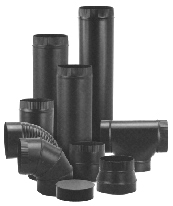 Keep black pipe 18" from combustibles! Use the straightest run possible. Do not exceed 3' of horizontal pipe unless the stove manufacturer specifically ALLOWS you to! Use 1/4" rise for every 1' of horizontal run. Never allow stove pipe to slope downwards. When installing a rear vent stove, exit the stove with a tee, not an elbow. This helps contain creosote buildup in the drop port on the tee.